Shiny Cradily in game: 49 Who? Important notice! Pokemon Shiny Cradily is a fictional character of humans. 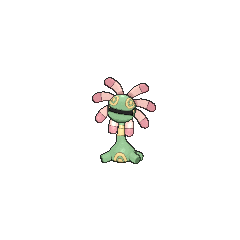 Cradily (Japanese: ユレイドル Yuradle) is a dual-type Rock/Grass Fossil Pokémon introduced in Generation III. It evolves from Lileep starting at level 40, after it is revived from a Root Fossil. Cradily is a green, plant-like Pokémon with various yellow markings on its head, neck, and torso. There are circular, yellow eyespots on its head. However, its true eyes are concealed inside the dark, crescent opening on its head. Surrounding its head at the base are eight pink tentacles, which somewhat resemble flower petals. These tentacles are used to capture prey, which is then melted with a strong acid secreted by the tentacles. Its long, flexible neck has yellow bands in the center, and it can be extended to assist in capturing prey. Its body is short and squat with four stubby growths and a yellow, oval, target-like pattern on the chest. In order to prevent being washed away by ocean tides, the body of this Pokémon is heavy. In ancient times it built its nest in the shallows of warm seas. When the tide went out, it was seen on beaches. 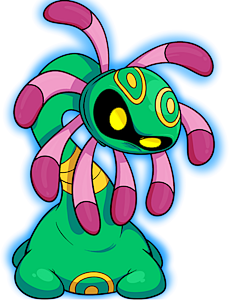 Cradily was first seen in Where's Armaldo? on Wales Island. 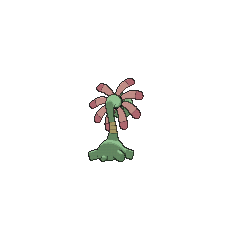 Cradily also made an appearance in Dealing With Defensive Types! with an Armaldo. One made another cameo in Lucario and the Mystery of Mew living in the Tree of Beginning. Also, one appeared in the opening of the movie. 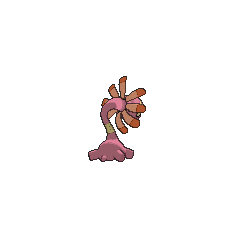 AG102 Cradily May's Pokédex Cradily, the Barnacle Pokémon. 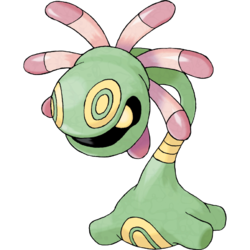 Cradily is believed to be able to extend its tree branch-like neck and catch prey with its tentacles. 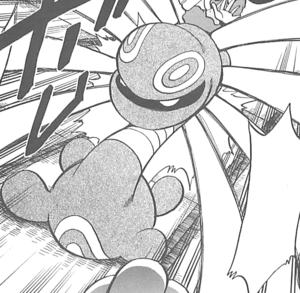 In Pokémon Adventures, Roxanne owns a Cradily, with which she battled Courtney and almost won until the Magma Admin took three men hostage. A Cradily helped Emerald when he was younger. Cradily is also used by the Advanced level Grunt of Team Galactic. It was used in an attempt to stop Diamond, Pearl, and Platinum from releasing the lake guardians from captivity. 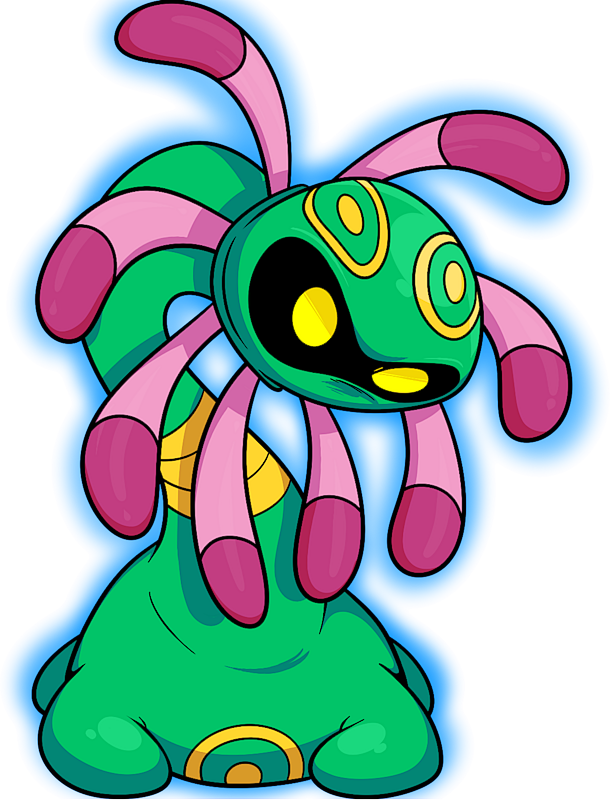 Pokémon Mystery Dungeon: Cradily is a member of Team Constrictor. Cradily's body serves as an anchor, preventing it from being washed away in rough seas. This Pokémon secretes a strong digestive fluid from its tentacles. It drags its heavy body along the seafloor. It makes its nest in the shallows of warm seas. Cradily can be seen on beaches when the tide goes out. It ensnares prey with its eight tentacles. It then melts the prey with a strong acid before feeding. It lives in the shallows of warm seas. When the tide goes out, it digs up its prey from the beaches. It lives in warm seas. Its heavy body weighs it down so it won't get washed away in rough weather. It lives in the shallows of warm seas. When the tide goes out, it digs up prey from beaches. Cradily’s body serves as an anchor, preventing it from being washed away in rough seas. This Pokémon secretes a strong digestive fluid from its tentacles. Moves marked with a superscript game abbreviation can only be bred onto Cradily in that game. 51%-100% HP Don't get dizzy looking at the patterns on my body! 26%-50% HP I think I've lost around half my HP. Level up I did it! I leveled up! My digestive tract's working great, too! For other sprites and images, please see Cradily images on the Bulbagarden Archives. Cradily is the only Pokémon with Pokéathlon stats where each one is a different level. No other Pokémon has the same type combination as Cradily and its pre-evolution. Furthermore, Cradily and its pre-evolution consist of the two types with most weaknesses, Grass and Rock, but they have only four weaknesses. Cradily and its pre-evolution are the only Grass-type Pokémon that belong in the Water 3 Egg Group. It may be based on crinoids, or sea lilies, marine animals related to seastars which were once believed to be extinct, or sea anemones. It also bears resemblance to the predatory tunicate. Cradily may be a combination of cradle and lily. It may also be a combination of crag or crazily and lily. Yuradle may be a combination of 百合 yuri (lily) and cradle. Mandarin Chinese 搖籃百合 / 摇篮百合 Yáolánbǎihé Literally "Cradle lily"